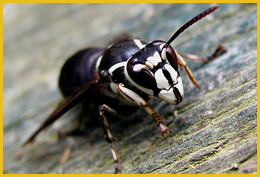 What is the life cycle for hornets and yellowjackets? The nests are annual and started in the spring by a single queen who alone survived the winter. She will begin the nest herself and build 20-45 cells enclosed in a sheet or two of paper envelope. The eggs take about 30 days to develop into an adult worker wasp. These first workers relieve the queen of foraging for food, building material, colony defense, and brood care. The queen can now focus on laying eggs and more workers are produced throughout the summer into fall. Around late summer they will switch to building larger cells that will rear the new queens for the following year. The males are usually reared in the small cells like the workers. The nests depending on the species will die out from late August until early December for other species. The old queen, workers, and males all die. Only the new queens survive the winter. How many species of social bees and wasps are there in Southeastern Pennsylvania? There are about a fifteen species you are likely to come across. Apis mellifera is the honeybee. 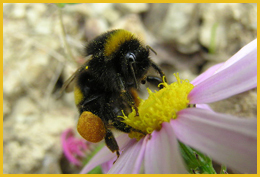 Bombus impatiens, B. griseocollis, B. bimaculatus, and B. perplexus are common bumblebees. 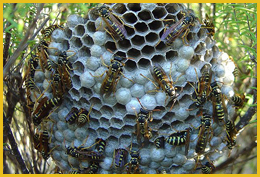 Dolichovespula maculata, D. arenaria, Vespa crabro, Vespula germanica, V. maculifrons, V. flavopilosa, V. squamosa, and V. vidua are the hornets and yellowjackets. 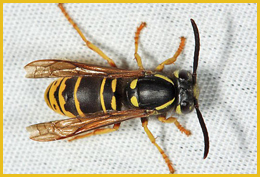 Polistes dominula, and P. fuscatus are the common umbrella wasps. Should I swat at a bee or wasp flying around me? When a person is outside at a barbeque or sporting event they may have a bee or wasp flying around them. The one thing to NOT do is swat at it. Swatting at the bee or wasp can cause it to become alarmed and sting. If the individual remains still for a moment the insect should fly off. Some perfumes can attract bees and wasps. It is also important to note that beverages should have lids and check them before drinking. A sting to the mouth can be life threatening.